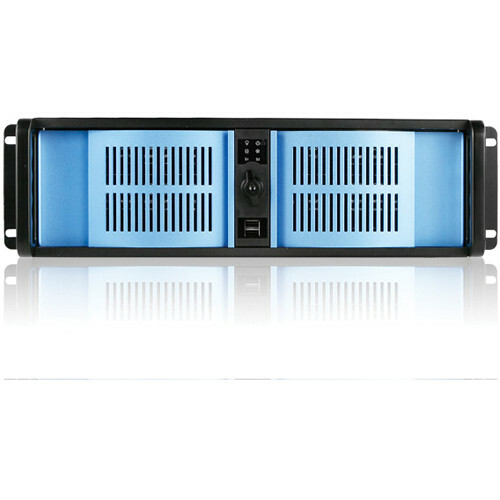 The iStarUSA D-300-BLUE 3U Compact Stylish Rackmount Chassis comes with a blue bezel and supports seven full-length add-on cards. The aluminum body (sold separately) reduces total chassis weight and also provides enhanced thermal cooling solution provide your system with maximum flexibility and performance. External Drive Bays 2 x 3.5"
Internal Drive Bays 1 x 3.5"
Box Dimensions (LxWxH) 27.0 x 22.0 x 10.0"
D-300-BLUE 3U Compact Stylish Rackmount Chassis (Blue Bezel) is rated 4.0 out of 5 by 1. Rated 4 out of 5 by Anonymous from Requires parts sold separately... =( I have wanted this case for as long as I can remember. The case looks freaking great in pictures with that icy blue, it has a locking bezel, and now I can rack mount my computer!However, the first thing you'll notice when you open the box is that the color is nothing like what's pictured. It's a more normal dark blue. Okay, fine.But then you go and try to install the power supply. It only attaches on one end. What? So I look around online for a video on installing 2U power supplies (I never have) and I can't find the one I have, but I find a similar one, and they say attach the rear bracket. What? What rear bracket? It didn't come with a rear bracket. So I go on the iStar website and turns out you need a bracket to install the power supply that isn't included in the box....Well, they don't sell them here, ... or anywhere else for that matter. In my scouring of the internet, I found exactly one seller that actually sells the bracket in question, though LOTS of sellers offer these cases and the power supplies they use, so I'm guessing that not a lot of consumers buy these. Otherwise, how could no one have noticed this already?Well, anyway, I order the bracket on some random website, wait a few days for it to arrive, it does, great. I install it. There's no way to attach the power supply to this bracket....I email iStar and they say Oh, it says right there on our website that you need to order TWO brackets. Why would I even think that to use the case I just ordered, I would need a second bracket to attach the power supply to the first bracket that's attached to the case? Surely, no one would miss that.Well, no one sells this second bracket anywhere (sorry, B&H photo, but you don't sell either of the required brackets), but I eventually found one on the same random website where I got the first one.Both times when I found the right bracket online (in the only store that had them), it was listed as only one in stock.How many of these cases could iStar (and B&H for that matter) possibly be selling if this is what the purchasing experience is like?Once you get it all set up though, it's still a neat case and at the end of the day, I'm happy I bought it, because now all of my rackmount case dreams are coming true.